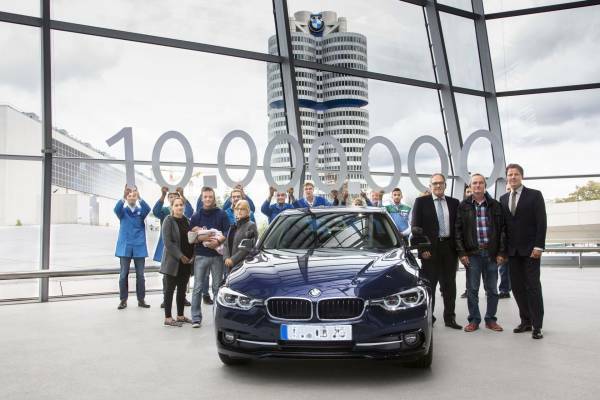 The ten millionth BMW 3 Series Sedan has been delivered to a lucky customer in Munich. The BMW 320d with an Imperial Blue was rolled off at the assembly line in the month of September at BMW Group’s Munich plant, marking a milestone in the success story of the BMW 3 Series. The new owner who received new BMW 320d was delighted to take possession of the vehicle at BMW Welt. Since 2007, handover at BMW Welt has been the perfect customer experience at the end of the new vehicle purchasing process. It was therefore appropriate that the ten millionth BMW 3 Series Sedan was handed over to its new owner, Xaver Bittl from Eichstätt, on the Premier stage at BMW Welt. There was an extra surprise, however, as factory workers who helped make the vehicle were also there to greet the customer and his family, holding up huge numbers to let the unsuspecting new owner know that his BMW 320d was the ten millionth of its type. For Xaver Bittl, who owns a driving school in Eichstätt and has been a BMW customer for many years, the reception at BMW Welt was an unforgettable experience. Accompanied by a camera team Mr Hermann Bohrer who is the head of the BMW Group plant in Munich, and Mr Helmut Käs who is the Head of BMW Welt Munich, congratulated the lucky customer. By selling over 14 million cars in more than 130 countries, the BMW 3 Series has become BMW Group’s most successful range. The success story of BMW started in 1975 when the BMW 3 Series was first premiered at the IAA Cars Show as the start of the line of sporty mid-range vehicles. Soon after that the the international bestseller has established itself as a pacesetter for the automobile industry in terms of sportiness, efficiency, comfort, connectivity as well as design. The Munich site has a special importance here, not only as far as production is concerned (each of the six generations has been manufactured at the BMW Group plant in Munich), but also with regard to vehicle handover. Vehicle handover is one of the central functions of BMW Welt. The architecture of BMW Welt was designed to make the initial contact with the new vehicle an unforgettable experience. The culmination of the handover process is the moment when the customer drives the new car off the Premier ramp and out onto the streets of Munich. The individually tailored schedule, including the personal attention of a member of staff, and the perfectly staged handover of the new vehicle regularly attract customers from all around the world, who come here to fulfill their personal dreams. Every day, between 80 and 120 handovers, and sometimes as many as 160, take place on the Premiere stage above the display area. Since BMW Welt was opened in 2007, almost 150,000 customers have collected their new BMW on the Premiere stage.